This issue's cover illustration by David Wyatt is from C J Busby's Cauldron Spells (978 1 8487 7085 0, £5.99 pbk). Thanks to Templar Publishing for their help with this March cover. By clicking here you can view, print or download the fully artworked Digital Edition of BfK 193 March 2012 . This is a book about a serious subject but with a bright and cheerful outlook. Miss Evans’ small class is missing her. She is not well but the supply teacher explains that she will ‘pop in’ when she can. The children sing her favourite song, ‘All Things Bright and Beautiful’ and wait patiently. When Miss Evans does visit, for the class play, she is in a wheelchair and has lost all her hair. We are gently prepared for the fact that Miss Evans is very ill indeed. When she dies, the children are encouraged to remember all the things she has taught them and to write down their special thoughts. 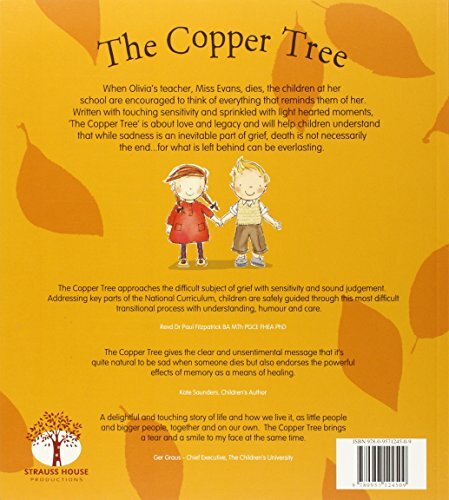 These thoughts are then transferred to leaf-shaped pieces of copper which are then put on a copper tree, where they ‘looked bright and beautiful in the sunbeams’ – ‘just what Miss Evans was like’. There is humour in the story and lots of smiley faces even through the sadness. We learn that it is good to talk about our sadness, and that better times will come. We even meet the class ‘difficult child’ in the person of Alfie Tate, who erases his name sixteen times from the get well card because he can’t write properly and causes ructions in the class play because he wants to play the giant. Sensitively handled and beautifully produced, this gentle and reassuring text with expressive illustrations will provide help to children facing bereavement in a number of different situations.